There is an interesting contradiction between what is detailed in the NHS Premises Directions, and the direction of travel for the provision of healthcare services in the community. The number of other healthcare providers being based in the community in doctors’ surgeries, is increasing. This has historically been the community staff, e.g. practice nurses and health visitors, and the accommodation used by such staff was always treated in the same way as GMS accommodation, i.e. being included within notional rent and rent reimbursement. The amount of accommodation at stake has typically been one or two rooms and therefore it hasn’t been much of an issue. However, recently I have come across instances of the community staff accommodation being excluded from notional rent/rent reimbursement which can cause problems. If premises are owned and subject to a mortgage, this may adversely affect how the practice is able to service the mortgage. Likewise, if practices lease the premises it may affect their ability to pay rent to the landlord. 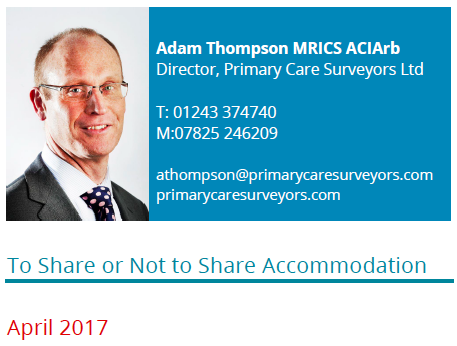 A consequence of community staff accommodation not being included with notional rent/rent reimbursement will be for the practice to then put the provider Trust on to a lease. This will incur both surveyor’s fees and legal fees in implementing such a lease. Furthermore, there may be a period of time between the notional rent/rent reimbursement being reduced and the lease being completed and rent then being received. I have also come across instances relating to part-time occupation of rooms such as by sexual health and phlebotomy services. In my opinion, this change of approach by some CCGs is excessive and is causing more problems for practices. This goes against the direction of travel of healthcare services and there seems to be quite a lot of administration and headaches to resolve, disproportionate to the extent of accommodation and/or time that the rooms are utilised. Hopefully common sense will prevail.